Tragedy has happened but I see a Nation waking up to the Police State that got 2 Cops away with Murder. I am delighted to see this. It is sad what happened. R.I.P to both the guys murdered by Cops. One who quit with $1 Million in donations and from a TV interview, just wrong, wrong, wrong. In both cases there should have been a court trial. In Ferguson 22 people said the EXACT same story, I am guessing because they are ‘Black’ A word you Americans just can’t stop using, is the reason nobody believes them and why they were not allowed to tell the story to the Grand Jury. In New York a cop chocked a man to death saying “I can’t breath” America, you are waking up to a police state! NYC DEMONSTRATION FOR ERIC GARNER – IS AMERICA FINALLY WAKING UP? NFL players and NBA basketball stars have shown their support for protesters angered by police violence against African American suspects. Cleveland Browns cornerback Johnson Bademosi wrote the words “I Can’t Breathe” on the back of a shirt he wore before Sunday’s NFL game against the Indianapolis Colts. Detroit Lions running back Reggie Bush also had the slogan written on his warm-up shirt. The slogan has been used to call attention to the death of Eric Garner, who died after a New York police officer used a chokehold during an arrest in July. A video of the arrest showed Mr Garner saying “I Can’t Breathe” after he was placed in the chokehold. Last week a grand jury decided that it would not indict the police officer. Bademosi said he wore the slogan to call attention to the case, which he described as “ridiculous”. “It’s not an us-against-them thing. It’s about us standing in solidarity with those of us who know what’s going on,” he said. Bush said he felt “touched” by the public outcry about violence against African Americans in recent weeks. “Honestly, I’ve always been the quiet kid. I’ve always been the one who’s reserved, to kind of sit back and not really get into politics and things like that,” he said. On Saturday, Chicago Bulls basketball player Derrick Rose wore the message on his T-shirt while warming up for an NBA game. There were violent clashes in California on the weekend as demonstrators took to the streets to protest the killings of African American suspects by white police officers. Protesters in Berkeley threw bricks, rocks and pipes at police, who fired tear gas and smoke canisters to quell the crowds. Peaceful demonstrations have also been held in New York, Philadelphia, Chicago, Miami, Las Vegas and Seattle, and a number of other cities. The protest in Berkeley took place hours after mourners gathered at the New York funeral of an unarmed black man shot dead by police on 20 November. Akai Gurley, 28, who had a two-year-old daughter, was killed when a police officer opened fire in a dimly-lit staircase at a Brooklyn apartment building. Friends and relatives filed past Mr Gurley’s open casket at the Brown Memorial Baptist Church to pay their respects. The funeral came after a series of deaths of black suspects, including 18-year-old Michael Brown, who was shot dead in Ferguson, Missouri, on 9 August. His death followed that of Mr Garner, a father of six who was killed in a chokehold by police in New York in July. In both cases a Grand Jury voted not to indict the white officer involved, sparking widespread anger. Last month, 12-year-old African American Tamir Rice was brandishing a replica gun when he was shot dead in Cleveland, Ohio, by police only seconds after they arrived at the scene. Protesters take part in a demonstration demanding justice for the death of Eric Garner in Manhattan, New York City, December 5, 2014. Fascism (/fæʃɪzəm/) is a form of radical authoritarian nationalism that came to prominence in early 20th-century Europe. Influenced by national syndicalism, fascism originated in Italy during World War I, combining more typically right-wing positions with elements of left-wing politics, in opposition to liberalism, Marxism, and traditional conservatism. Although fascism is often placed on the far-right within the traditional left–right spectrum, several academics have said that the description is inadequate. Fascist ideology consistently invokes the primacy of the state. Leaders such as Benito Mussolini in Fascist Italy and Adolf Hitler in Nazi Germany embodied the state and claimed immense power. Fascism borrowed theories and terminology from socialism but replaced socialism’s focus on class conflict with a focus on conflict between nations and races. Fascists advocate a mixed economy, with the principal goal of achieving autarky to secure national self-sufficiency and independence through protectionist and interventionist economic policies. Following World War II, few parties have openly described themselves as fascist, and the term is usually used pejoratively by political opponents. The terms neo-fascist or post-fascist are sometimes applied more formally to describe parties of the far right with ideological similarities to, or roots in, 20th century fascist movements. The hacktivist collective Anonymous has called for a nationwide ‘march of millions’ next Saturday to demand justice for Michael Brown, Eric Garner, and other African Americans who have died as a result of police violence. The ‘Day of Anger’ event, carried under the burgeoning #Blacklivesmatter social movement, is set to take place on December 13. Although tentatively scheduled to kick off in New York City, the hacktivists call for protests all across the nation. “We must not only show our power, but show that there is still hope for humanity, we must show the world these deaths are not in vain,” the group said in a Facebook post. Protests have broken out across the country after a grand jury decision that acquitted a white New York City police officer of any wrongdoing in the death of Eric Garner, a 43-year-old black Staten Island resident, on July 17. The incident, ruled a homicide by the medical examiner, was videotaped by a passer-by and put online. In it, the officer can be seen placing Garner in an illegal chokehold while a group of other officers force Garner to the ground. Garner, who reportedly suffered from asthma, died after repeatedly saying, “I can’t breathe” – a phrase that has become a rallying cry for the protesters. The Garner decision came shortly after a Missouri grand jury decided not to indict a white police officer in the death of Michael Brown, 18, who was shot multiple times following a confrontation with police in Ferguson, Missouri despite being unarmed. On Saturday, protests against police brutality turned violent in Berkley, California. Police deployed tear gas and smoke canisters to disperse the protesters after being pelted with bricks, rocks and pipes. With the demonstrations all over the USA for Ferguson kid https://acenewsdesk.wordpress.com/2014/11/26/trouble-is-starting-all-over-the-usa-ferguson-burning-usa-flag/ Michael Brown now we see a HUGE demonstration in New York City again, with both white and black people again and this time for Eric Garner. I have been saying and asking for over a year now if the people of America will EVER stand up to the Police State that now surrounds them, what I have seen in the last week is 100’s of thousands of people demonstrate, some in anger, some in peace for the murder of two guys, one a kid the other an adult. Both times by white cops killing black people. I still find it uncomfortable using the ‘Black’ word but I guess I have to here. I think the American people are slowly seeing for themselves what a Police State is. A people oppressed can only stay oppressed for so long right? We need only look to Palestine to see a people react with anger to what is for them, a Police State in GAZA. I know many Americans will disagree with what I just said there but show me where I am wrong? American people, white as well, remember the black cop who killed the white kid and it hardly hit the news? Well if you don’t I found it. The exact same thing happened with Eric Garner, Micheal Brown and white kid Gilbert Collar who was shot dead by black cop Trevis Austin in 2012 https://acenewsdesk.wordpress.com/2014/11/29/white-teen-killed-by-black-cop-in-alabama-mirrors-ferguson-but-no-outrage-racist-usa/ We are now witnessing people waking up and standing up, this was New York last night singing ♫I can’t Breath♫ And yes, many were arrested although everyone was peaceful. Racism is alive and well in America but lets be really sure here, it is done by the American media and the US Government. There is no question the high end US Media, TV and Print are run by Politicians, there is no question in my mind. What I find staggering also is the Media and many people, they believe EVERYTHING the police say but not one word coming out of the mouth of witness’s who happen to be black people. In both cases Eric Garner, Micheal Brown a bunch of people had to decide “Was this murder” in both cases these people in court said “There was no charges to be brought on either policeman” The Cop who killed Michael Brown has retired with a cool £1 Million in his pocket https://acenewsdesk.wordpress.com/2014/12/02/ferguson-darren-wilson-to-receive-1-million-dollars-from-tv-and-supporters/ For anyone inside America reading this are you not disgusted by the actions and happenings of the last few weeks? I sadly have met and unfriended a few American people who tell me “America’s problems are all the Black People” May I also add most of the people who said this were deeply religious people. I won’t name their names that would be wrong but I do invite them to come onto this blog that they WILL READ and defend the statements they made regarding black people ruining America. Again, Religion causing problems. 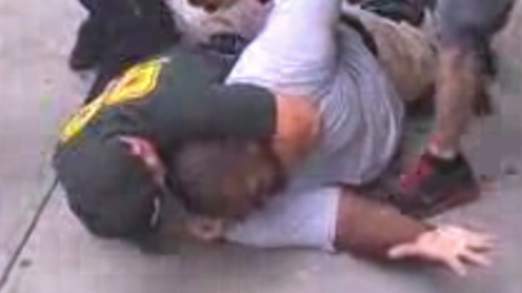 I blogged this NYPD cop killing a man with a choke hold, well the Cop is being charged with homicide. The New York City medical examiner’s office Friday confirmed what demonstrators had been saying for weeks: A police officer’s choke hold on a man being arrested for selling loose cigarettes killed him. 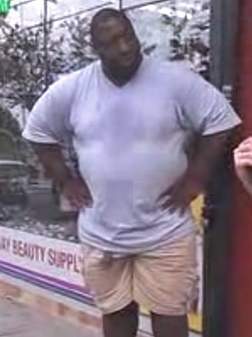 Eric Garner, 43, died July 17 after being confronted by police on Staten Island for allegedly selling cigarettes illegally. During the encounter, Garner raised both hands in the air and told the officers not to touch him. Seconds later, a video shows an officer behind him grab the 350-pound man in a choke hold and pull him to the sidewalk, rolling him onto his stomach. “I can’t breathe! I can’t breathe!” Garner said repeatedly, his cries muffled into the pavement. The cause of Garner’s death was “compression of neck (choke hold), compression of chest and prone positioning during physical restraint by police,” said Julie Bolcer, a spokeswoman for the medical examiner’s office. The death was ruled a homicide. Acute and chronic bronchial asthma, obesity and hypertensive cardiovascular disease were listed as contributing conditions in a controversial death that sparked anti-police demonstrations and calls for a federal investigation. Douglas Auer, a spokesman for the Richmond County district attorney’s office, said the investigation into the death was continuing. “We await the issuance of the official death certificate and the autopsy report,” he said in a statement. The U.S. Justice Department has said it is monitoring the investigation. If local prosecutors decline to file criminal charges, the federal justice department could conduct an investigation into whether the victim’s civil rights were violated. “The District Attorney will be examining the case to determine if the use of the choke hold was necessary to subdue and arrest Garner, or was an excessive use of force resulting in death,” CNN legal analyst Paul Callan said. A former deputy chief of homicide for the Brooklyn District Attorney’s office, Callan said a choke hold does not violate state law but is prohibited by NYPD guidelines on excessive force. There was no immediate reaction from Garner’s family but they were expected to speak at a Harlem rally with the the Rev. Al Sharpton on Saturday. Mayor Bill de Blasio Friday expressed his “deepest sympathies” to Garner’s family. “My administration will continue to work with all involved authorities, including the Richmond County District Attorney, to ensure a fair and justified outcome,” he said in a statement. “We all have a responsibility to work together to heal the wounds from decades of mistrust and create a culture where the police department and the communities they protect respect each other … I’ve said that we would make change, and we will. As mayor, I remain absolutely committed to ensuring that the proper reforms are enacted to ensure that this won’t happen again. The video of the incident showed the Staten Island man lying on the ground motionless after he was taken down by a group of officers. An asthmatic, Garner was later declared dead at a nearby hospital. Police said he suffered a heart attack and died on the way to the hospital. “This is a terrible tragedy that occurred. … A terrible tragedy that no family should have to experience,” de Blasio said after the death, calling the video of the incident “very troubling.” Garner, a grandfather with six children, had a lengthy criminal history, including more than 30 arrests, and had been previously arrested for selling untaxed cigarettes in May, according to police. But demonstrators in New York called the police response during his arrest excessive and criminal. On July 19, Garner’s friends and family rallied with Sharpton in Harlem, demanding a full investigation into Garner’s death. Officer Daniel Pantaleo, who is seen on the video choking Garner, was put on modified assignment and stripped of his badge and gun amid the investigation, the New York Police Department said. A second police officer was placed on desk duty. The choke hold tactic is prohibited by the NYPD. Eric Garner suffered a cardiac arrestbootleg cigarettes. The officers then surrounded him and when he apparently resisted arrest, one placed him in a choke hold and wrestled him to the ground. Mr Garner could be heard shouting “I can’t breathe!” as he was held on the pavement. He suffered a cardiac arrest and died at Richmond University Medical Center on Thursday, the New York Daily News reported. bootleg cigarettes. The officers then surrounded him and when he apparently resisted arrest, one placed him in a choke hold and wrestled him to the ground. Mr Garner could be heard shouting “I can’t breathe!” as he was held on the pavement. He suffered a cardiac arrest and died at Richmond University Medical Center on Thursday, the New York Daily News reported. New York Mayor Bill de Blasio released a statement after his death. “On behalf of all New Yorkers, I extend my deepest condolences to the family of Mr Garner, who died yesterday afternoon while being placed in police custody,” he said. “We have a responsibility to keep every New Yorker safe, and that includes when individuals are in custody of the NYPD. “That is a responsibility that Police Commissioner Bratton and I take very seriously. “We are harnessing all resources available to the city to ensure a full and thorough investigation of the circumstances of this tragic incident.” New York Police Commissioner William Bratton told a news conference on Friday: “Choke holds are prohibited by the New York City Police Department and most departments.” Mr Garner was reported to have broken up a fight shortly before his arrest.